But unlike Reeves and Mortimer, the Boosh zookeepers turned postmen Howard Moon (Juilan) and Vince Noir (Noel), never leave their own world. The Mighty Boosh inhabits a universe entirely of its own. Brilliant series, different content from the tv show so it is a must for Boosh fans! Great to see where it all started. First heard The Mighty Boosh back in about 2006 and i have listened to the radio show thousands of times since. For anyone who enjoys what Noel Fielding and Julian Barret do on TV, you will not want to pass up this, similar stories like the Witcher and locations like the Jungle Room but somehow i think this is the funniest and most interesting version. Well worth a purchase, you won't be disappointed. A fantastical and rambling romp. Leave your sense of reality behind. Very enjoyable and a good companion to the tv show. I listen to a lot of BBC Radio Comedy from their website, everything from the Goon Show to the Pythonesque 80's. When I caught the last segment of The Boosh, I immediately did an Audible search to buy the rest of it. The characters are instantly established and the comedy that ensues is some of the funniest ever recorded. Simply and brilliantly absurd. Like Python, it will surely be repeated verbatim from the lips of the next generation. I almost didn't buy this because I thought it might be just audio from the TV series, which I've already watched a few times. But no, it's all fresh material! Very similar to the TV show, but not the same. If you enjoyed the show, or even if you've only seen the infamous "Old Gregg" sketch on Youtube, you will LOVE this audio performance. 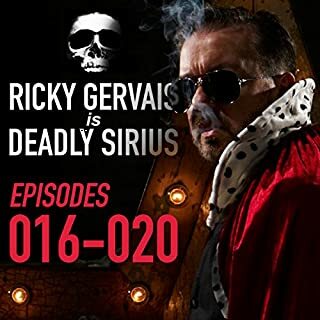 The boys do a fantastic job of conveying all the bizarre images and ideas of their world in a radio-show format. It sounds great and I found myself laughing uncontrollably every five minutes or so. There's also an interview with the guys at the end. If you've never heard or seen Mighty Boosh before, it's a totally absurd and surreal semi-improvised comedy act. It centers on two main characters, with help here from a third. There's a loose framework that the two main guys are employed in a zoo owned by the third guy, and the zoo does come into it, but only as a launching point for utterly insane otherworldly shenanigans. 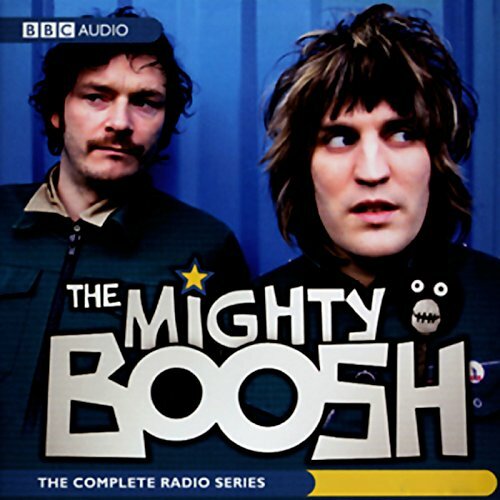 If you're already a fan of Boosh, buy it. If absurdity makes you laugh, buy it. If you like everything to remain neat, logical, and under control, keep moving. 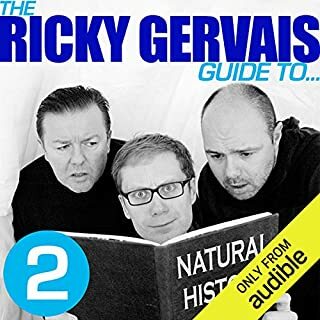 This is one of my favorite Audible downloads. Lots of fun with wit and improvosation throughout. Do yourself a favor and spend a book credit. If you don't find yourself laughing out loud, ask someone you trust if they think you have a sense of humor. Cheers! What made the experience of listening to The Mighty Boosh the most enjoyable? Just as fun and entertaining as the TV show! Bob Fossil cracks me up every time! What does Noel Fielding and Julian Barratt bring to the story that you wouldn’t experience if you just read the book? These two have great chemistry together and work off each other so well. I laughed out loud at more then a few points. TV Series was better but this is a hoot! If you could sum up The Mighty Boosh in three words, what would they be? What was one of the most memorable moments of The Mighty Boosh? The tv show is better due to the surreal visuals & hilarious antics of the cast. Bob Fossil is one of my favorites. The great thing about this audio version, however - is that you get to use your imagination, which is what it's all about! Great precursor to the tele show. Hilarious and supernally strange. To hear these variety of characters is a look inside the wild genius mind-creators. This is not for everyone, but that is okay. It can be thought provoking then laugh-aloud uproariously funny. Cannot recommend this one enough. If you love the show theb you will love the radio show! Its a MUST BUY! boosh boosh stronger than a moose! Would you consider the audio edition of The Mighty Boosh to be better than the print version? 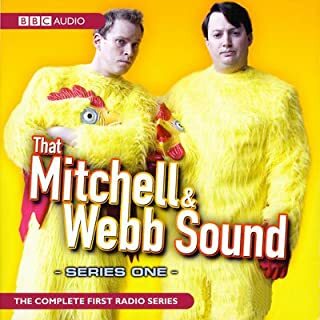 Just finished listening to the radio series and my enjoyment of it is tinged with sadness that that's it and there is no more. If you loved the Mighty Boosh TV series, this won't disappoint you either. Noel Fielding admitted that in his opinion, the radio show was the best one by far, because so much of it is left to the listener's imagination. The TV series is such a visual feast, but the radio series does firmly stand on its own and is hugely enjoyable. The adventures are timeless and will definitely stand the test of time. Vince and Howard's friendship is very believable, even though they are complete opposites of each other. I think most viewers/listeners will find them relatable and identify more with one or the other. Despite the banter, there's this quality of ease that can only exist between two people who know each other very well and have become like extensions of each other's selves. Have you listened to any of Noel Fielding and Julian Barratt ’s other performances? How does this one compare? I love the TV series of the Mighty Boosh, and I have listened to "An Evening With Noel Fielding", some "Luxury Comedy", as well as seen "Mindhorn" with Julian Barrat (absolutely hilarious). I would say that the TV series of the Mighty Boosh is still my favourite, but that could simply have to do with the order in which I discovered it all. Personally, I feel that anything they are in will leave you feeling like you just bathed in warm sunshine after a bleak winter. Noel Fielding is a darling and will elevate and inspire you. If you're loved the Boosh in any way, shape or form, just go for it! The Scenery is better in Your head! The Boosh is like ... Sardines - you either love them or you hate them. I'm afraid I'm the former, so if you really don't like them, then this format probably won't convert you. However, if you're into wordplay, verbal imagery & surreal comedy, then this is still the best place to hear them at their zenith. First is that this is the First Boosh release. Hence it is fresh, creative & had not been done before. You may recognise some parts of it from the TV episodes (e.g. Howard Moon having one leg shorter than the other), but this is where they FIRST used this stuff, so it lacks the tongue-in-cheek nature of later repeats. Second is that this format allows your imagination to go wild! Though the TV show is great, there is something even better when you concentrate on the words. For instance, the line 'What is this voodoo? Black Milk? The Wet Jigsaw?' would be ignorable on TV, but here your brain generates an image which puts a different spin on it. Third, and best of all, is Bob Fossil! Bob Fossil didn't do much in TV Series one and was killed off. But here he is fantastic! There's even a song about him, which is inexplicably missed out on TV (despite the fact that it is arguably the Boosh's greatest song). And, some of his lines are amazing. When I'm stressed at work, I find one of his lines (said at exceedingly high volume) can always crack people up. Anyhow, my apologies if I seem over-enthusiastic, but I'm genuinely yet to find anything (on Amazon) as compelling & brilliant as the Mighty Boosh. And of all that they've done, this easily ranks as the best. That said, feel free to take in other reviews for a balanced perspective. If you still feel drawn to it afterwards then I promise you: you won't regret it. You have to listen to this. It is so funny, hip, and down right odd. I've fallen in love with the world of the Mighty Boosh and hope you will too. 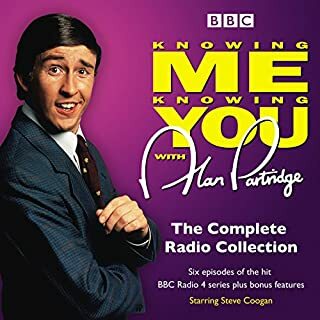 This collection contains all 6 episodes of the 2002 BBC radio series. The show is written and performed by celebrated stand up comedians Noel Fielding and Julian Barrett and features characters they created for their highly acclaimed Edinburgh Fringe shows The Mighty Boosh, Artic Boosh and Auto Boosh. Each episode centers around zoo keepers Howard Moon and Vince Noir as they skank out of their zooly duties and set off on some fool's erand. Adventures include: befriending polar bears, looking for a man with a really big head, releasing hideous mutants/animal hybrids, transporting a killer prawn to a zoo for bad animals and chasing the jazz train. If you have seen either of the hit BBC 3 TV versions of The Boosh then you know the kind of thing to expect; but you are in for a real treat! 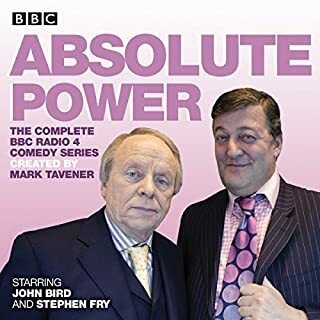 The radio series is looser, more improvised and much funnier then the TV show. If you need a basis for comparison, it's surreal like Vic Reeves Big Night Out, features outlandish stories like Comic Strips Presents, but still manages to be funny. If surreal comedy is not your thing you should still give it a try. Fielding and Barret's characters and outlandish situations manage to capture the essence of classic Steptoe and Son. Two opposing men apparently trapped together for eternity, getting up to all sorts. I cannot recommend this highly enough. I downloaded this purley out of curiosity, and it has turned out to be one of the funniest things I have ever listened to. Like the very best comedy you can listen to it again and again and enjoy it as much if not more as when it was heard for the first time. Having watched the TV version, I think that the orginal radio show has the edge - with a smaller cast and less visual distractions I find that I can enjoy the characters and brilliant oddness of the whole thing a lot more. Odd, yet very funny. Featuring three central characters supported by talking gorrila's, psychotic prawns and mutant raven's with a blackbirds body (bit subtle that one). If you like obtuse and ridiculous situation comedy, this one's for you. If stand up is the only form of comedy you enjoy, steer clear of this. All other audiobooks work fine on my tablet but this one just says "can't conect to server". Will definitely be returning this. I think I prefer this to the tv series, it's so good! Great to see where a lot of the jokes and characters came from and how episodes changed before going to tv. 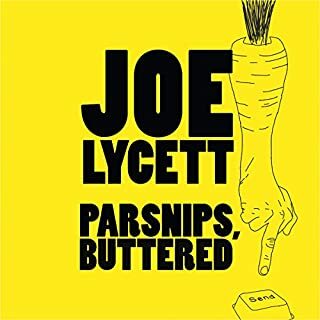 All performers are fantastic as usual, if you are a fan of the boosh, you NEED to get this! 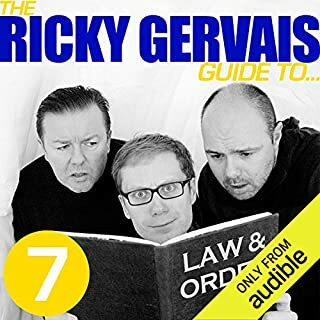 So glad I can listen to this on Audible. Love the TV show but this has an edge over it for me.